Svetlana Alexievich was born on May 31, 1948 in the Ukrainian town of Ivano-Frankovsk into the family of a serviceman. Her father was Belarusian and her mother Ukrainian. After her father’s demobilization from the army the family returned to his native Belarus and settled in a village where both her parents worked as schoolteachers. (Her father’s grandfather was also a rural schoolteacher.) After finishing school, Alexievich worked as a reporter on the local newspaper in the town of Narovl, Gomel Region. As early as during her school days she wrote poetry and contributed articles to the school newspaper. At that time she needed a two-year work record (the rule in those days) in order to enroll in the Department of Journalism of Minsk University, entering it in 1967. During her university years she won several awards at the republican and all-Union competitions for scholarly and student papers. Having received her degree she was sent to the town of Beresa, Brest Region, to work at the local paper. At the same time Alexiyevich taught at the local school. She was torn between various career options: to continue the family tradition of school teaching, scholarly work, or journalism. But after a year she was invited to Minsk to work on the Rural Newspaper. Several years later she took the job of a correspondent for the literary magazine Neman and was soon promoted to the head of the section for non-fiction. She tried her voice in various genres, such as the short story, essay, and reportage. The famous Belarusian writer Ales Adamovich had decisive influence on Svetlana’s choice, particularly his books I’m from the Fiery Village and The Book of the Siege. He wrote them jointly with other authors but the idea behind them and its development were entirely his own, and it was a new genre for both Belarusian and Russian literature. Adamovich was looking for the right definition of the genre, calling it a “collective novel,” “novel-oratorio,” “novel- evidence,” “people talking about themselves” and “epic chorus,” to name a few of his appellations. Alexievich has always named Adamovich as her main teacher. He helped her to find a path of her own. But new times came with Mikhail Gorbachev’s ascent to power and the start of perestroika. In 1985 The Unwomanly Face of War came out simultaneously in Minsk and in Moscow. In subsequent years it was repeatedly reprinted; all in all more than two million copies were sold. This novel, which the author calls “the novel-chorus,” is made up of monologues of women in the war speaking about the unknown aspects of World War II that had never been related before. The book was hailed by war writers as well as the public. Figure 1. Svetlana Alexievich (front row, middle). Photo from the archive of S. Alexievich, early eighties. In the same year her second book came out: The Last Witnesses: 100 Unchildlike Stories, which had also languished unpublished for the same reasons (pacifism, failure to meet ideological standards). This book also ran into many reprints and was acclaimed by numerous critics, who called both books “a discovery in the genre of war prose.” The war seen through women’s and children’s eyes opened up a whole new area of feelings and ideas. 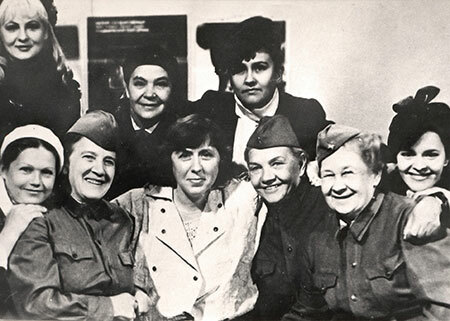 The 40th anniversary of the war was marked by the theatrical production of The Unwomanly Face of War at the renowned Taganka Theater (staged by Anatoly Efros.) The Omsk Drama Theater received the State Prize for its production of The Unwomanly Face of War. The play based on this novel was running in many theaters around the country. A cycle of documentary films was produced on the basis of The Unwomanly Face of War. The film cycle was awarded with the State Prize, and received the Silver Dove at the Leipzig Documentary Film Festival. Alexievich also received many other prizes for this work. 1989 saw the publication of The Boys in Zinc, a book about the criminal Soviet-Afghan war that had been concealed from the Soviet people for ten years. 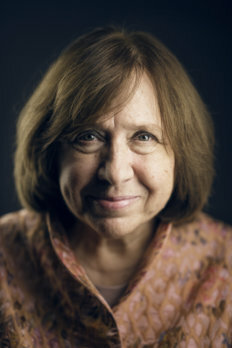 To collect material for the book Alexievich traveled around the country for four years to meet war victims’ mothers and veterans of the Afghan war. She also visited the war zone in Afghanistan. The book was a bombshell and many people could not forgive the author for de-mythologizing the war. To begin with, the military and Communist papers attacked Alexievich. In 1992, court proceedings were opened against the author and her book in Minsk. The democratically minded public rose in defense of the book. The case was closed. Figure 2. 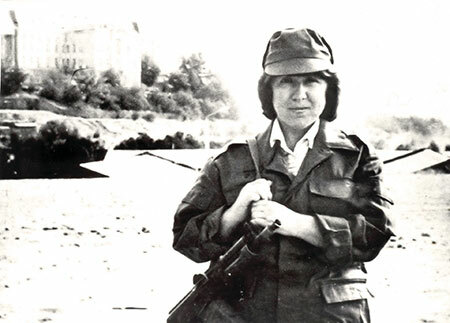 Svetlana Alexievich, Kabul, 1988, Photo from the archive of S. Alexievich 023. Later several documentary films and plays were based on this book. In 1993, she published Enchanted with Death, a book about attempted suicides as a result of the downfall of the socialist Soviet Union. Those who attempted suicide were people who felt inseparable from socialist ideals, who were unable to accept the new order, the new country with its newly interpreted history. The book was adapted for the cinema (The Cross). In 1997, Alexievich published her book The Chernobyl Prayer: the Chronicles of the Future. The book is not so much about the Chernobyl nuclear plant disaster as about the world after it: how are people adapting to the new reality, which is already here but is not yet perceived. Post-Chernobyl people have gained new knowledge, which is of benefit for all of mankind. They live – as it were – after World War III, after a nuclear war. The book’s subtitle is very significant in this respect. At present, this writer of international renown and dedicated critic of the dictatorial regime of her country is living in Minsk, Belarus. Her books have been translated into 45 languages and published in 47 countries so far, formed the basis for a dozen plays, and more than twenty of her scripts have been filmed as documentaries. 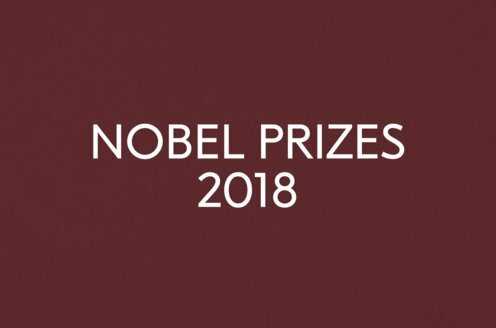 She is the recipient of numerous awards, including the 2015 Nobel Prize in Literature, the 2013 Peace Prize of the German Book Trade, the 2013 French Prix Médicis essai; the 2013 Best Book of the Year Prize by the French literary magazine Lire for her book Time Second Hand; the 2011 Ryszard Kapuściński Award for literary reportage (Poland); the 2011 Angelus Central European Literature Award (Poland) ; the 2006 National Book Critics Circle nonfiction award for “Voices from Chernobyl (New York); the 2001 Erich Maria Remarque Peace Prize (Osnabrück); the 2000 Robert Geisendörfer Radio Play Prize of the German Academy of the Performing Arts (Berlin); the 1999 “Témoin du Monde award (Paris); the 1998 Best Book on Politics of the Year award of the Friedrich Ebert Foundation (Bremen); the 1997 Andrei Sinyavsky Prize (Moscow); and the 1996 Kurt Tucholsky Prize of the Swedish PEN Club (Stockholm). These questions acquire a new implication in connection with the latest events in Belarus where a military-socialist regime has been restored, a post-Soviet dictatorship. And now Alexievich is again unwelcome to the authorities in her country because of her views and her independence. She belongs to the opposition, which also includes the country’s finest intellectuals.